A chemical kinetic model has been assembled based upon previous literature to assist in developing a better understanding of the mechanism behind the electron beam irradiation of humid air. 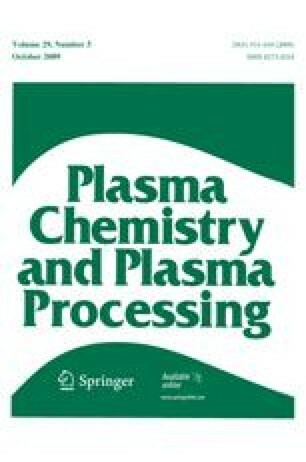 Thermodynamic determination of the feasibility of particular product sets was used to eliminate certain reactions proposed previously, dynamical models were used to guide the choice of product sets, and updated rate constants were obtained from the current literature. Tracers were also used to determine significant sources and sinks of hydroxyl radical, an important species in the irradiation process. Modeling results for selected species have been presented for 1 atm of air at 298.15 K and 50% relative humidity, at doses of 1, 5, 10, 25, and 50 kGy delivered over 0.8 s. The concentrations of the most abundant ions, radicals, and stable reaction products have been included, as well as the calculated major sources and sinks of hydroxyl radical. The online version of this article (doi: 10.1007/s11090-009-9186-y) contains supplementary material, which is available to authorized users. This research was supported by grant CTS-0626302 from the National Science Foundation. The authors thank M. R. Cleland for sharing results of the ITS code, M. S. Driscoll for helpful conversations, and H. Hu for help with quantum calculations.